We’ve been serving the valley for more than 75 years. Our unparalleled technical skill and know-how can only be learned by years of experience. We’re the largest, and oldest, residential HVAC company in Arizona. In fact, most air conditioning systems in Arizona were installed by us. Chas Roberts was the company of choice by our home builder Presley Builders, 30+ years ago and it is still my choice! Thanks for keeping a good thing going! Had two visits from Chas. Both techs were knowledgeable, thorough, and friendly. I did not feel pressured to get services I did not need. Great service. I will go through Chas Roberts when it is time to replace my aging unit. Jose was outstanding and very good at explaining what needed to be done and what he did. He is another in a long line of Chas Roberts employees who ably represent your company…that is why we continue to use Chas Roberts! The Chas Roberts Technician, Hector, serviced our HVAC. He was very professional, courteous and respectful of our home. He kept us informed on the progress of the repair every step of the way. Hector also gave us tips to ensure the system continues to run properly. He did an excellent job and we are very satisfied with the results. In the future we would like Hector to be our technician. Your technician “The Brick” was the best. He went above and beyond to make sure our equipment was functioning properly. It’s rare to find a service person who is interested in doing more than what was requested – it was as if we were his only call that day which of course was not true. He is a shining star. Family-owned and operated for multiple generations, we’ve provided Arizona families with comfortable living environments for more than 75 years. 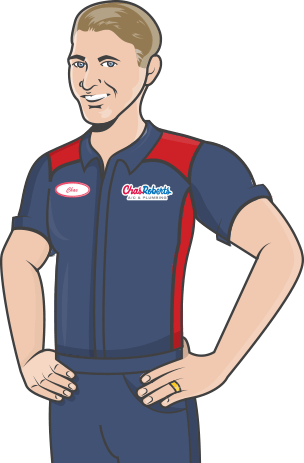 As the largest HVAC provider in Arizona, serving the Metro Phoenix and Tucson areas, we deliver peace of mind to homeowners by backing our service with highly trained personnel. All our technicians are certified and have successfully completed the rigorous Chas Roberts Customer Service Training Program on top of being licensed, bonded, and insured. We’re an experienced and reliable company. Our history speaks for itself.